Inverness based DJ who has been instrumental in the Inverness dance scene since 2004 when he co-founded local club night Audiolife. 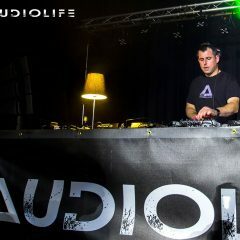 Alan started DJing in 1998 and is now resident DJ with Audiolife, Technique, Resonance and Decoded. Having being invited to play at local festivals, Belladrum, Rockness, Groove and The Mad Ferret, then going on to play at venues outside of Inverness at Snafu and SWG3. Over the last 10 years Alan has played warm up DJ to some massive names in the music Industry, warming up for artist Funk D’void, Phil Kieran, Justin Robertson, Deadmau5, James Lavelle, Altern-8, Harvey McKay, Tom Middleton, Dave Clarke, Mark Archer, Slam, Gary Beck, Silicone Soul, Hans Bouffmyhre, Nathan Coles, Harri & Domenic, Octave One, A Guy Called Gerald, Jon Desilva, Mr. C, Vitalic and many more. Each artist presented a different challenge giving him invaluable experience and a masterclass apprenticeship. This has helped him to shape his sound and learn the true art of DJing.